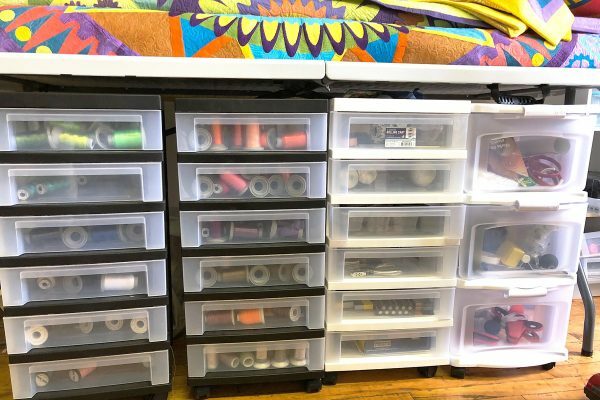 You know that old adage “A place for everything and everything in its place?” We think this piece of advice is really important for your sewing space! Keeping things organized where you sew can help you be more productive and save time when the tool you need is always within easy reach. Here are some really clever sewing organization tips to try in your own sewing space. 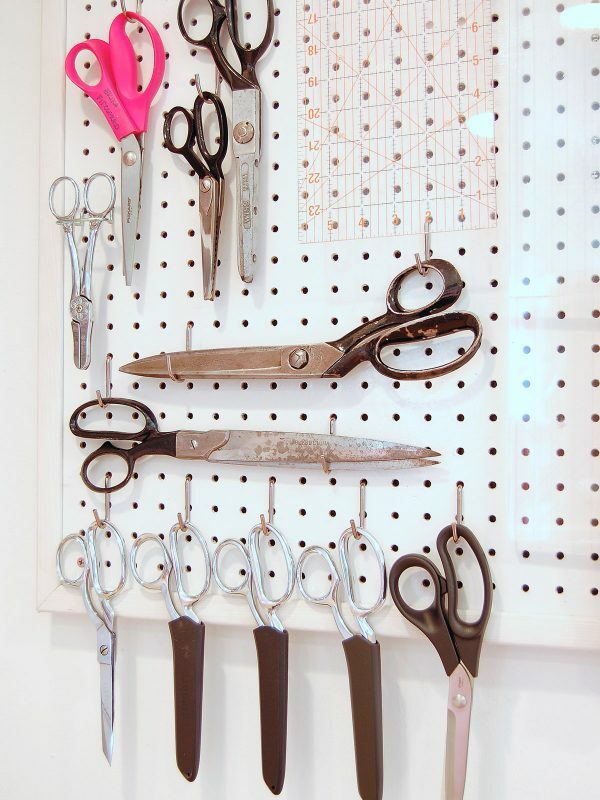 Pegboard is probably one of the most versatile ways to organize in your sewing space. You can use pegs of different shapes and sizes to hang notions like thread spools or tools of all kinds. Pegboard and pegs of all shapes and sizes can be purchased at your local home improvement or hardware store. 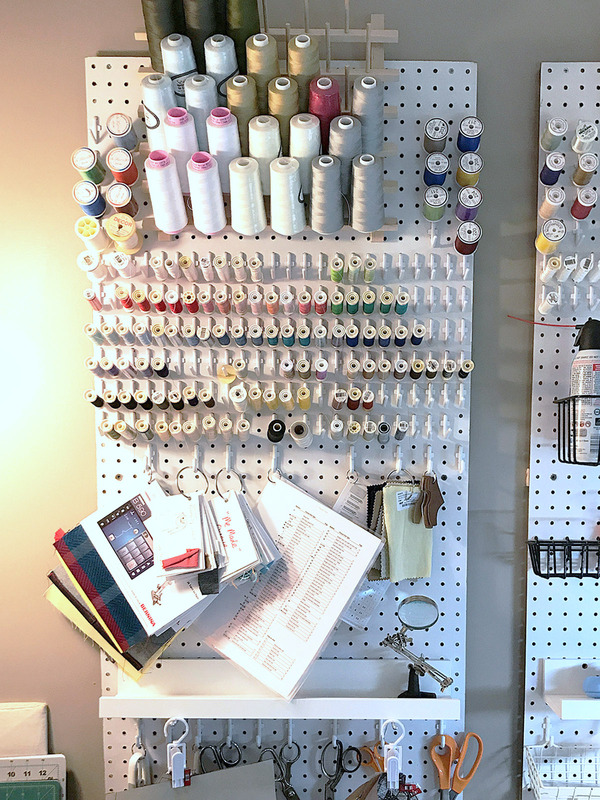 Caroline Henbest uses pegboard to organize threads, scissors, and other tools that she uses frequently. Erika Mulvenna has used pegboard as a way to keep scissors handy and display some of her vintage shears. 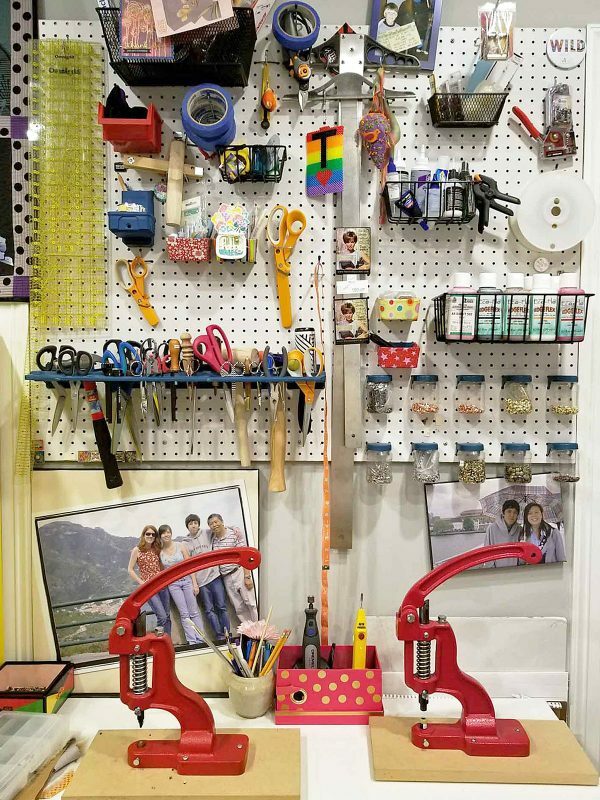 Teresa Duryea Wong makes great use of pegboard to keep all kinds of sewing and craft supplies easy to find. 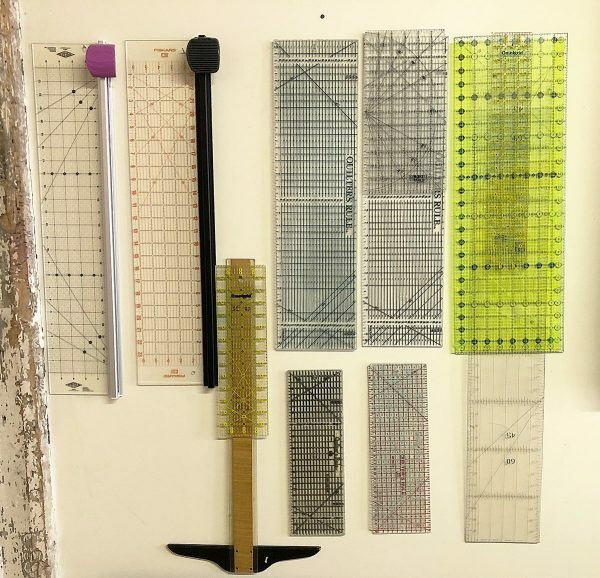 Rulers can be tricky to store, especially odd-shaped or large sized rulers. 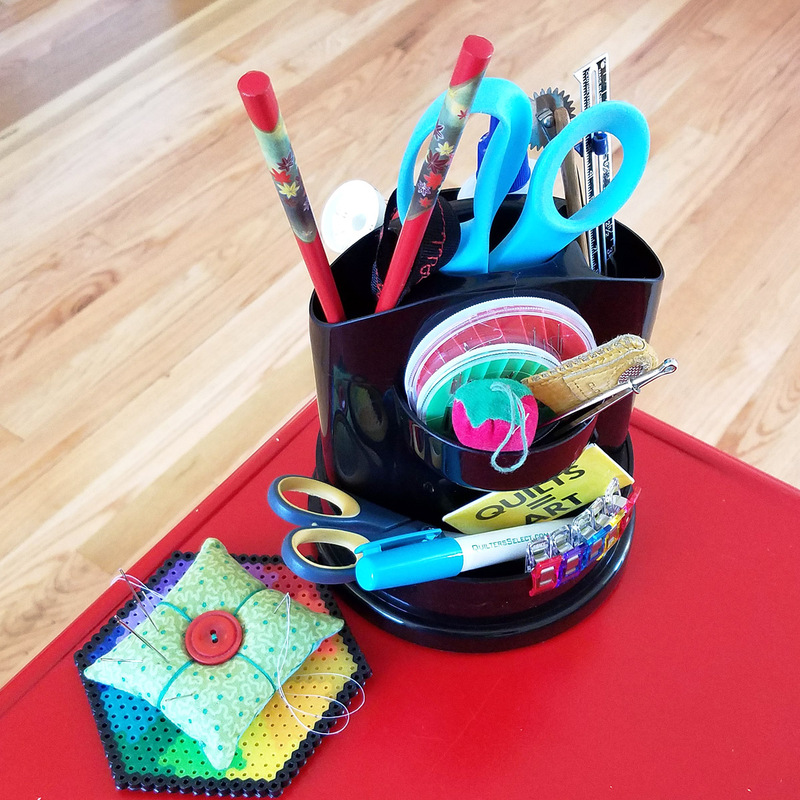 Check out these clever solutions to the problems of ruler storage. Using Command Brand Hooks or nails on a wall or door to create custom storage for large or odd-shaped rulers. 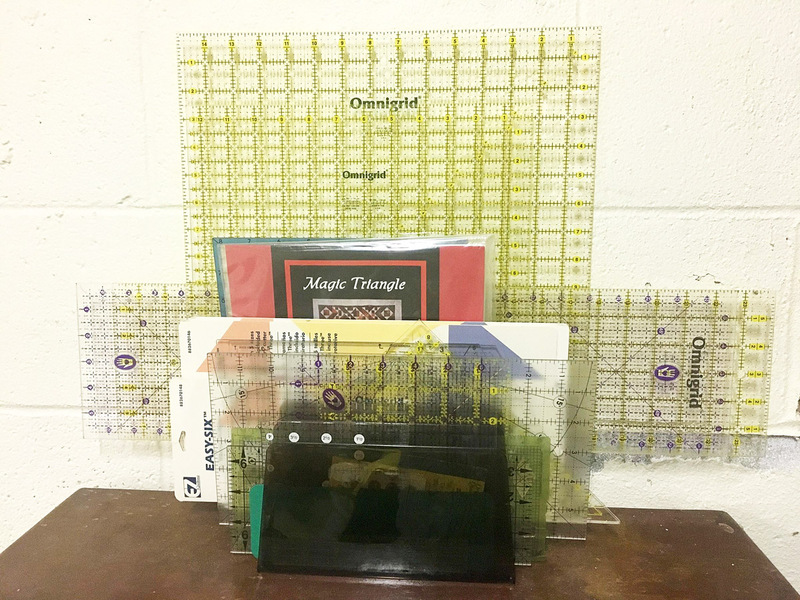 Standing file folder or magazine holders also make fantastic organizers for rulers, and can be found at any office supply store. Robbi Joy Eklow created the perfect place to store rulers on a wall in her brand new studio. Command Brand Hooks will also work, and can be removed later without damaging walls. Scott Murkin uses a file folder organizer to hold rulers, patterns, and die cutting templates. Erika Mulvenna uses a magazine holder to store rulers of all sizes in an easy-to-access way. 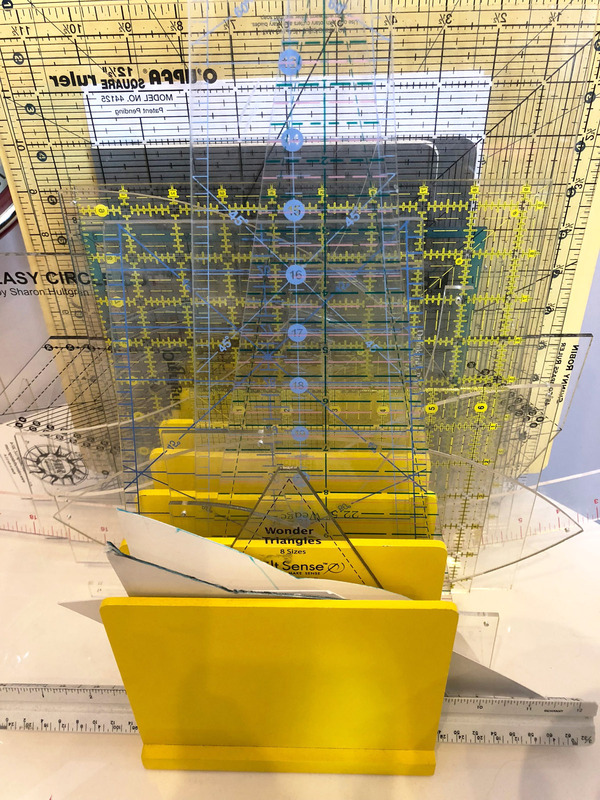 Jacquie Gering uses a brightly colored vertical file organizer to keep all of her many, many rulers in order. Rolling carts have been appearing more in sewing spaces as handy ways to store notions, tools, and supplies. Since these carts are on wheels, you can easily store them out of the way when you don’t need them, and roll them out when you do. These carts come in all shapes and sizes and you can find them with bins or drawers. 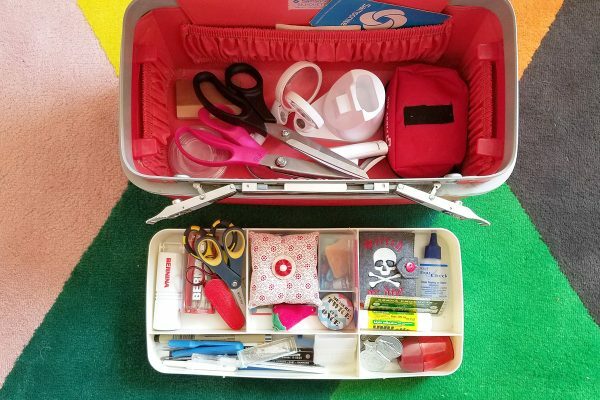 Robbi Joy Eklow uses rolling carts with drawers to organize all kinds of tools and supplies! 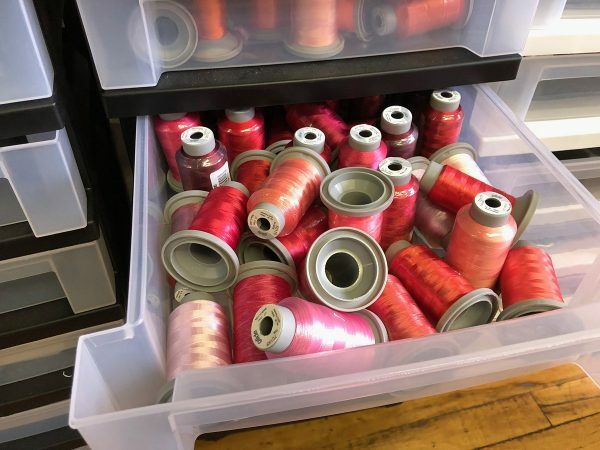 Just look at how many Isacord thread spools she’s got organized in those carts. 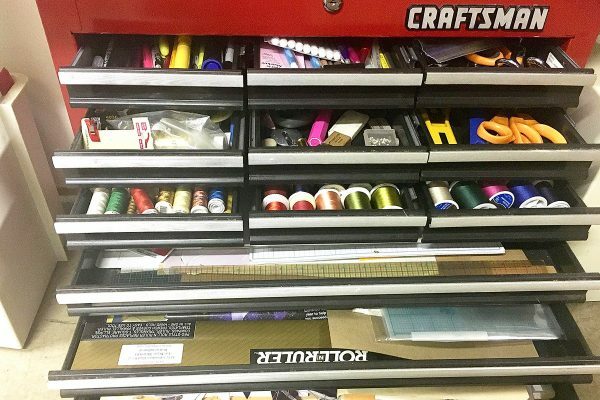 Scott Murkin’s rolling storage is the ultimate use of a large rolling tool chest! Very large flat drawers pull out all the way to access all kinds of tools and notions. 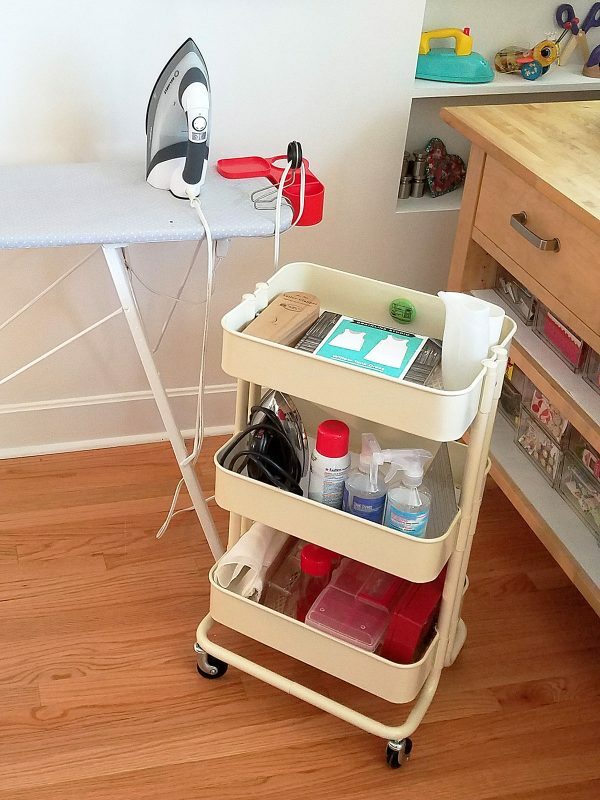 Erika Mulvenna uses an open rolling cart to store pressing and ironing supplies, handy at the ironing board just when you need it. 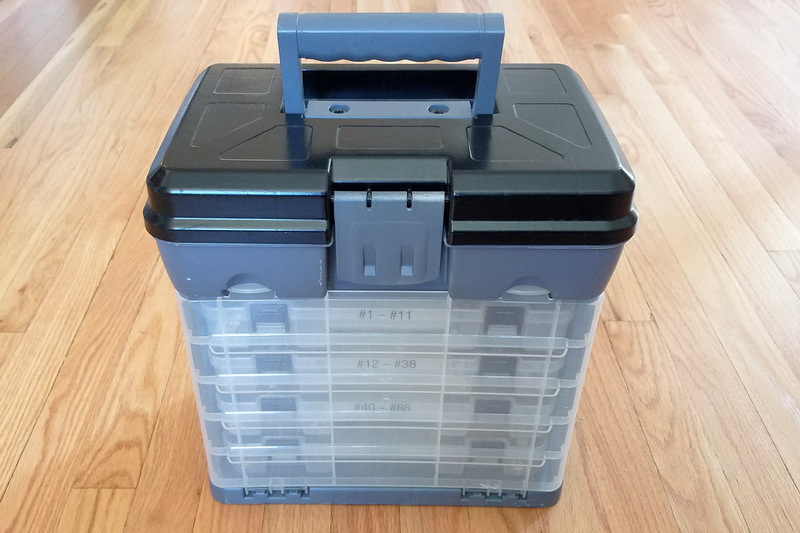 Containers make to hold tools, fishing supplies, or other small supplies can make excellent storage boxes for sewing supplies or sewing machine feet and accessories. Erika Mulvenna uses a simple tool box to organize sewing machine accessories and feet. This toolbox has a deeper storage area on top, and smaller bins that pull out from the front of the box cleverly organize feet and accessories. And here’s a small travel case meant to hold toiletries that’s been transformed into a sewing box. Small compartments in the top tray hold all kinds of notions and supplies, and there’s plenty of space in the travel box for a travel sewing light, scissors, and more. It just so happens that flatware and utensil drawer organizers are the perfect size to hold sewing supplies! You can purchase these organizers at virtually any big box store, or look for similar drawer organizers in office supply stores. 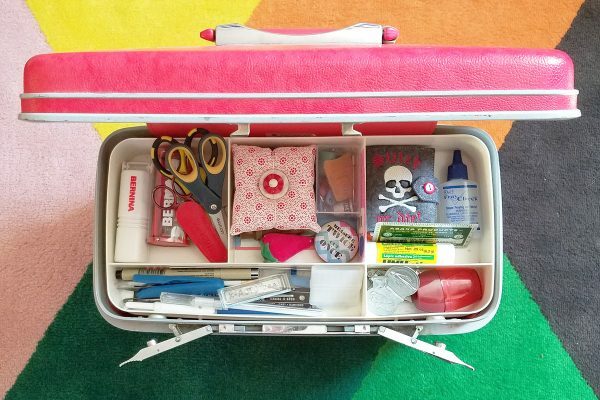 Robbi Joy Eklow keeps small tools and supplies organized in a rolling cart with a simple flatware organizer. 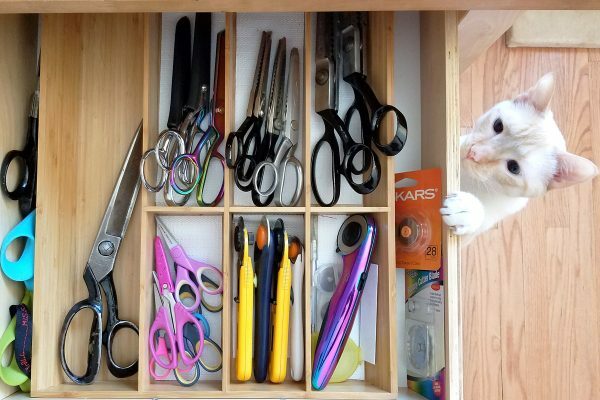 Erika Mulvenna organizes sharp cutting tools inside a flatware tray stashed away in a drawer where little paws can’t get to them. 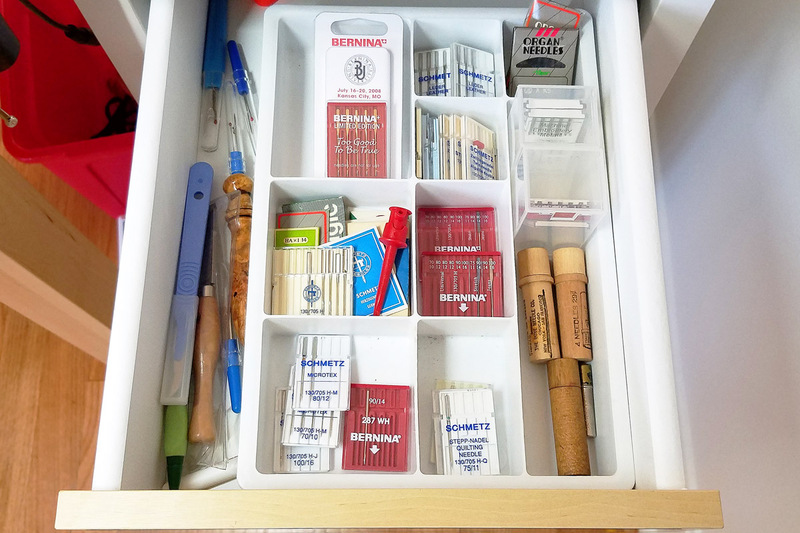 Drawer organizers sold in office supply stores meant to keep paper clips and rubber bands in order also create order for sewing machine needles. And desktop organizers have just the right kind of compartments to keep sewing tools in place next to your sewing area. I’ve just moved and have my dream sewing space, at last. I’ve been collecting, far longer though. That being said, many of the items I use for storage I’ve picked up at garage sales, thrift stores, etc. I put my money in machines and accessories and other tools (and of course, fabric). I have utilized the thread racks that hold about 100 spools, and use 2 for my quilting thread stash. The only reason I’m willing, is because the thread has cellophane on each spool (as sold). I use Superior Threads magic tape on opened spools. The rest of my thread is in a lingerie cabinet with glass drawers and an antique milliners shop thread cabinet (I have a bigger thread stash than fabric, I think). I imagined a rack for Bernina Feet for years, utilizing the grey inserts for the feet cabinets that come with many of the machines. Never got around to getting one made, but one on Etsy that was just what I imagined. I have over 50 Feet, so the Storage is perfect. The normal square, rectangle, etc. are hanging from curtain clips or shower curtain rings, depending on the ruler size and weight. They’re hanging from spring tension rods that are suspended between a piece of furniture and a wall. Below them I have a couple of the grooved ruler holders for the largest square up Rulers, etc. All of my small sets of templates, such as Quilt in a Day or Marti Michell are in photo boxes used for scrapbooking. I got about a dozen of the 4”x6x1” and about 5 of the 5”x7”x1” plastic cases and used a labeler to mark the contents of each. The labels are facing up in the drawer I keep them in. 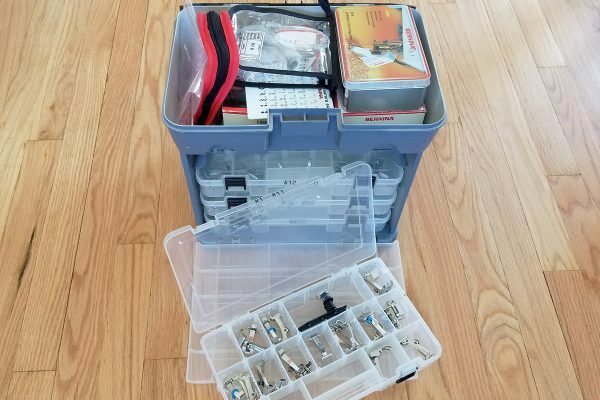 I just utilized the scissors on peg board and have the rolling cart that was in my laundry room up until I read this article, now utilized for all of my pressing tools. 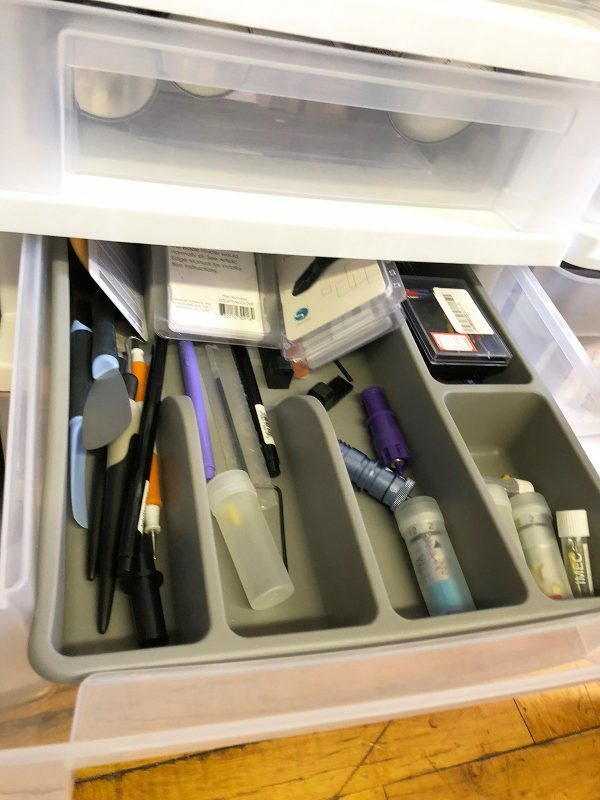 One of my favorite other places to stash small items is in a blue print drawer. I have 1 drawer dedicated to My Bernina embroidery hoops, and larger accessories (crystal, paint, cut works, eyelet tool, etc. ), buttons, 1 for beads and such, another for measuring tapes and smaller rulers for drafting, etc., and one for rubber stamps. 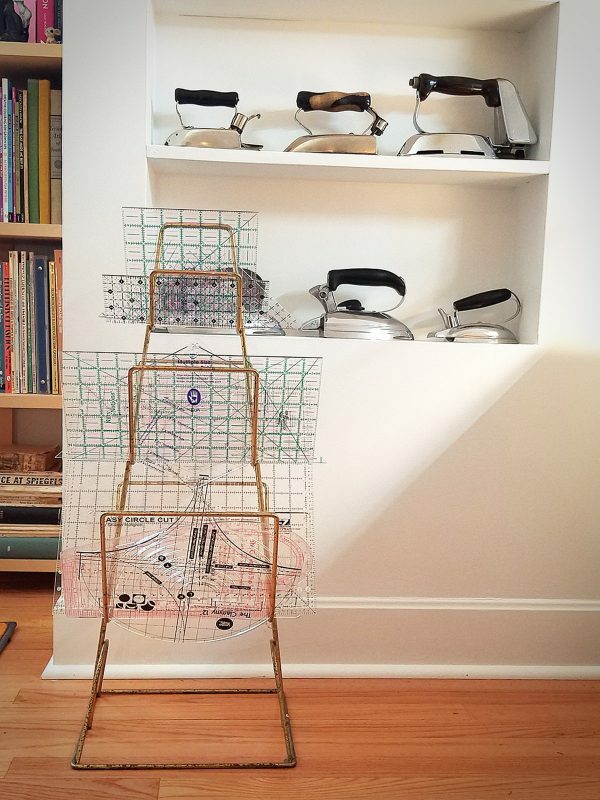 For ribbon, I found an over the door rack meant for bathrooms, that has about 6 baskets (white wire). I painted it gold with spray paint you can use on plastic. I will try to take pictures and post in my Sewing Room board on Pinterest. Some are already posted. Ginnie, I LOVE your ideas–so much so that I’ve incorporated many of them already. I am especially grateful for the Bernina feet hint (I will check it out on Etsy). I have an 880+ now, and the extra-large width severely limits the number of feet I can crowd into the mini-cabinet that came with the machine. Please post pictures! One final note I would add concerning multiple brands of storage bins–they don’t always fit nicely together. So if I can find a bunch of same-brand containers, I will go with them. I am especially fond of see through these days! I’ve found that if it cannot be seen, it will likely not be used. I have a label maker, and I furiously label my containers, but I still have an incomplete idea of what the heck I have. Very Nice! I too have some ideas/photos that I would like to share. How would I post them. Thanks to the seamstress who told me how to control my paper pattern inventory. The system replicates a fabric store with a binder of pattern pages with the envelopes elsewhere. I use my printer scanner to make a double side image of the pattern envelope front and back. That page is filed, like the store’s binder, among its catagory: mens, children, crafts, shirts , dresses, etc, however you think. I use a separator tab page between the catagories. The paper patterns are in cardboard covered boxes sold by Nancy’s Notions. I file them by number, NOT by category and ignoring brand. This makes that binder full of, ah, pattern envelopes WITH THEIR NUMBERS my code for immediately plucking out that original intact pattern. I shop my binder for ideas. Rarely, an indy pattern has no number so I give one at random, writing it on the envelope before photocopying and, of course, filing it by that number in those handy pattern boxes. The boxes are labeled in sequence only, all 8 of them. They live in deep storage in a dark, dry corner. I am glad printers are handy now.